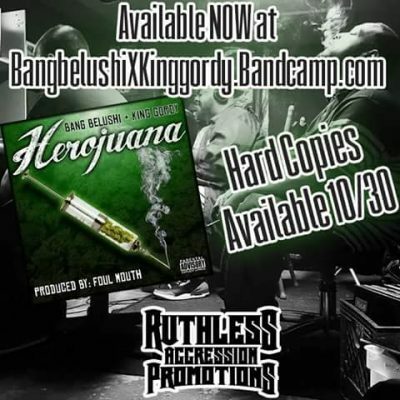 Less than two months ago, the collaboration EP Herojuana was released for FREE on Bandcamp. Bang Gelushi and King Gordy knocked this EP out in a single day and released it on August 20th. They have decided to put out a VERY limited run of hard copy albums. 100 copies to be exact. How can you get them? Well, 50 will be sold by Ruthless Aggression Promotions and the other 50 will be sold by King Gordy himself. The hard copies will be available on October 30th, so be on the lookout!